Heritage matters to Matt '67 and Jean Byerly '67 Kokkonen. Matt takes pride in his Finnish ancestry-he immigrated at 16-and played for the first Warrior soccer team as the "Flying Finn." The couple began their married life in Finland, where Matt pursued a master's in philosophy and Jean taught English. They later returned for a year with their two children. Matt also earned master's degrees in financial services and management from the American College of Financial Services in Pennsylvania. 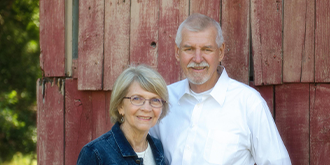 Nearly 50-year residents of San Luis Obispo, the Kokkonens work in insurance and financial planning (Matt) and property management (Jean). They've been deeply involved in their church and the community. Elected to the San Luis Obispo County Republican Central Committee, Matt ran as the Republican nominee for Congress in San Luis Obispo and Santa Barbara counties. A pilot for the Sheriff's Aero Squadron and the Civil Air Patrol, he has also flown mission flights to Mexico. The couple marched at Commencement last year as Golden Warriors for their 50th class reunion. Deeply appreciative of their Westmont education, they give back to the college. Early on, Matt made Westmont the owner and beneficiary of a life insurance policy. "The miracle of life insurance is that it pays the charity the much larger gift I wanted to leave at the end of my life-more than I could have otherwise made-even if I died the next day. And the premium payments are tax deductible as charitable donations," he says. "I'll never pay as much in premiums as the policy will pay Westmont." Through their lives and giving, the Kokkonens honor their heritage. Reproduced with permission from the 2018 summer issue of the Toward Tomorrow newsletter. For more information about making gifts with life insurance contact the Office of Gift Planning at (805) 565-6058 or giftplanning@westmont.edu.